Life became kind of busy all of a sudden. We're in the last couple of weeks of the school year now and there's a lot going on. I'm feeling a little disoriented - stunned, even, and not really sure when this happened, but we're in it now. The GB had her class musical performance yesterday and it was adorable. She has been in a "multi-age" class this year at preschool; the class is comprised of both three- and four-year-old children; it was a good choice for her, having a fall birthday and being small for her age. Her class sang several songs by themselves, then the "threes" class joined them. Afterward, there was a little reception on the playground. She ran off with her little girlfriends so I decided to leave her until normal pick-up time, though some parents were taking their children home early. Summer is long, so I let her stay and play. They had much better popsicles at the reception than I ever buy, so she was certainly amenable. I'm trying something new on the hook with some Stylecraft Special DK. It will ultimately become a pillow cover, if I can get the joins right. 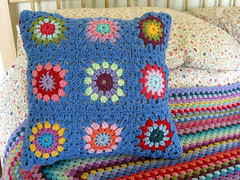 I'm using a tutorial from the Sols(tr)ikke blog, her "circle in a square" pattern, which she uses for her "flowers in the snow" blanket. I want to eventually make one of these blankets, so I thought I'd practice on just a few flower-squares for a cushion cover. I think I might have to resort to sewing them together, though; they just don't look right in join-as-you-go format. Hmm...I'll just keep trying, I guess. 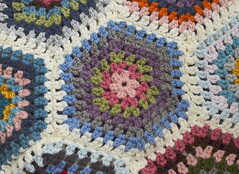 I really want to assemble the blanket that way when I get around to making it. Lizards are everywhere in the backyard; I caught one sunning himself on the flagstones of the porch at mid-morning. I had gone out with my tea and a book, to enjoy a little quiet time while both small Bears were at school on Tuesday. The lizard was surprisingly calm and stayed there even as I went back inside to get my camera. I think he was lulled by the warmth of the stones. We had our first rainbow of the spring/summer. New Mexico is known for being a very rainbow-y kind of place. We had a slightly stormy evening during the week, with dark clouds to the south and east but mostly clear skies to the north and west; at sunset, a microburst came through, bringing sudden gusty winds and a spritz of rain with the evening sun still shining. It was beautiful and interesting even before I noticed the rainbow in the eastern sky. Have you seen my giveaway post? 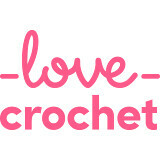 If you haven't already entered, please go here for your chance at winning a crocheted scarf made by yours truly. Your pictures are always so pretty! The base ten blocks bring back a lot of memories - I have a set packed away somewhere in our storage room, waiting to hand down to grandchildren at some point. Lovely pictures you show us Jennifer!Here. it's already summer and the flowers are going to disapear! We have small little green geckos. I hope they eat mosquitos?? Thanks for dropping by and becoming a follower. I will reciprocate - if Blogger will allow! I love your photos especially the last one of the rainbow. Hi Jennifer, it must be nice to feel the warmth of the sun. It's still quite cool here in north west England, there are still pockets of snow on the fells and eating my own strawberries is a distant dream. Keep trying to add the motifs as you work, it saves so much time and all those ends to weave in. I really love your photos today, gorgeous, especially the rainbow one. Sounds like you have had a busy week! Lovely photos, Jennifer. I feel a bit stunned with all the busy of late too. Hope the renovation project goes well! Always nerve-wracking having big things done in the home but worth it in the end. And love love love that rainbow picture by the way! Yum, sweet potatoes! Good luck with your renovation project, always a bit scary but so satisfying when it works out well! A renovation project - very exciting! We had wood floorboards laid when we moved in and I love them and they suit our open-plan house, but sometimes (in the winter) I think how nice it would be to have a carpet in our living room which is the room we use in the evenings more. Oh, that picture of the rainbow is beautiful. Hope you have a wonderful day.